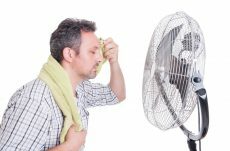 It’s definitely air conditioning season in the vast majority of the United States, particularly in areas where daytime temperatures have been rising a dozen or more degrees above 100. New research conducted in Japan shows that while air conditioners make you more comfortable, the airflow from the vents may actually cause problems while you sleep. The research team had subjects sleep in two bedrooms set to the same temperature using ACs set at different airflow velocities, then made a comparison of the depth of sleep and body temperature control using electroencephalogram (EEG) measurements as well as subjective reporting by the subjects. Researchers found that the subjects sleeping in the higher airflow room had significantly greater body movements, an increased heart rate and a higher frequency of waking. This suggests the general AC may have some influence on sleep, as subjects rolled over or their sleep depth changed the moment cool air blows out. The result of this study is expected to be a useful clue as to how to configure the airflow velocity of an AC to create a comfortable sleeping environment.